In 2006, the Executive’s Ten Year Strategy for Children and Young People – Our Pledge was launched. The Strategy outlined how the Executive would improve the well-being of our children and young people in areas such as education, health, environment, rights etc This Strategy, which was developed following significant consultation with stakeholders, concludes in 2016 and the Department of Education is beginning the process of developing a new Strategy. The new Strategy will be expected to consider the key issues facing children and young people and outline how Government will work collaboratively to improve the well-being of our children and young people. The Department of Education are developing the new Strategy through co-design – engaging with Departments, external stakeholders and children and young people throughout the process to gather views, test assumptions and develop an agreed approach. The process of design, development and drafting will continue alongside engagement and consultation with stakeholders. The programme of work has 4 key phases as follows. tackling the long term issues that affect the well-being of our children and young people (issues raised included CAMHS, integrated education, age of criminal responsibility, child poverty, physical punishment, negative stereotyping, support during periods of transition etc). Work is also underway to work with Departmental colleagues and identify existing and forthcoming policies, strategies and legislation which link to the Children and Young People Strategy. Thematic groups, aligned to the core strategic outcomes, will be established to analyse information, gather evidence, consider baselines and discuss potential actions. This will be done in partnership with children and young people and stakeholders. This is designed to be an inclusive process and all those who wish to involved will be accommodated. The Department of Education has launched a public consultation on the Executive’s Children and Young People’s Strategy 2017-2027. 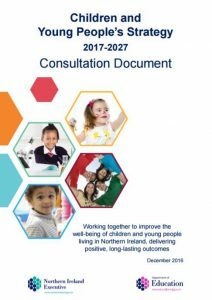 The strategy is designed to improve the wellbeing of all children and young people living in Northern Ireland. The draft strategy in the form of a consultation document has been developed and agreed with Departmental colleagues and Ministers. Again, this has been developed in partnership with children and young people and stakeholders. A formal consultation is now underway and will run from 19 December 2016 until 5pm pm Monday 27 February 2017 inclusive.